Jalopy is packed with features. It does not stop with mere code formatting, but Jalopy actively helps you maintain your code. Comply with naming conventions, arrange methods, generate and sanitize Javadoc comments, insert missing or remove obsolete braces, add override annotations, serial version UIDs, optimize import declarations, remove redundant modifiers... you name it. 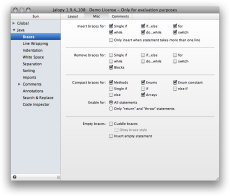 And best of it all, Jalopy tightly integrates with all major Java IDE applications like Eclipse, IDEA, NetBeans and build tools like Ant and Maven.